High Definition (HD) is, certainly easier on the eyes without. Compared to the standard definition, HD gives you the most vivid details gradations finder, truer colors and contrasts and more precise contours. Just plug the cable HDMI (HDMI) to any HD source and enjoy the optimized images and sounds each time. Receive the free channels of satellite television and digital radio. Get HD and SD satellite TV channels. Do not worry about your satellite connection. 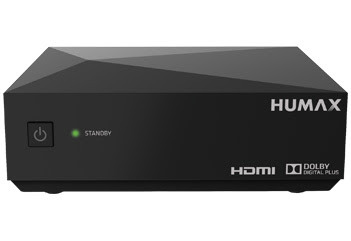 The receiver detects satellites automatically and searches faster using the HUMAX motor. You can easily update your receiver. New versions can be updated via the automatic update service software (OTA) via satellite. 1. Download the latest file and save it to an empty USB memory stick. 2. Connect a USB memory stick to the STB. 3. Turn on the STB with a long press of the standby button on the front panel. 4. Release the standby button when the downloading starts. 5. The STB turns off and on automatically when the downloading is complete.